In this post I have posted lyrics of Sai Kasta Nivaaran Mantra in Hindi which is said to be very powerful to ward off dangers. It lyrics are simple and each devotee can relate it one's own condition or situation. As the mantra is written in Hindi language I am sharing with you all in its original form and print outs can be taken for reading daily. Before proceeding further I want to share my own experience regarding this mantra with you all. The main aim to share my experience with you is to make you all aware of the power and importance of this mantra. When we went to Shirdi during last Diwali (November 2008) my mother bought it. She now reads it daily. Once or twice I had also read it and I loved the lyrics of the mantra. I dont know who has written it but after reading it I was quite sure that the poet must have got good experiences of Sai Baba and so he could compose such a great work.It was rightly said by Sai Baba in Sai Satcharitra Chapter 17 to Mrs. Tendulkar regarding her son who was to appear for medical examination, Tell your son to believe in Me, to throw aside horoscopes and predictions of astrologers and palmists and go on with his studies. Let him appear for the examination with a calm mind, he is sure to pass this year. Ask him to trust in Me and not to get disappointed. The last two lines perfectly fit me and the situation which I went through.I am pursuing MBA distance learning from Pune. In February 2008 I had exams of first semester. As it is distance learning course there is no examination center in my town. The centre is only at Ahmedabad. So I had go to Ahmedabad to appear for exams. In this university the students have the freedom to give exams at their own convenient time and convenient day. So I decided to give exams for six subjects in six days a week to avoid gaps in my work. But Sai Baba was behind me and I did not get dates for continuous six subjects except for three subjects which were comparatively easy for me and for the remaining subjects which I found a bit difficult I got gaps. For this I thanked Him when I faced difficulty in completing the syllabus. Out of three consecutive subjects, for the first two I did well. On the day before the third exam I was exhausted due to continuous up down to Ahmedabad for two day and I was not sure whether I would be able to complete the revision of syllabus. With Baba's grace I could complete it well in time. But I was unaware that there was something unusual and unexpected reserved for me. Unlike other exams that day my mother accompanied me as my father got stuck in some urgent and important work. As said earlier it was my mother's practice to read Sai Kashta Nivaran Mantra daily. That day in hurry she could not complete her regular reading so she took the small book with her. She planned to read it when I would be in examination hall for one hour. 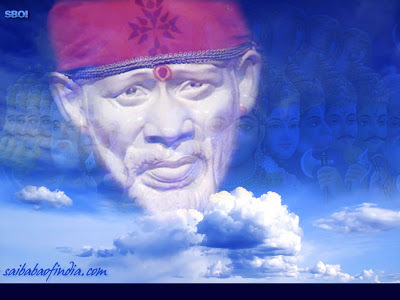 After praying mentally to Sai Baba for helping me in my exam I started. When the questions appeared before me it seemed to be out of the blue. I was completely blank. In panic I forgot answers of those questions which were known to me. As it was objective tpye exam all the four options seemed to be the best possible answer. It was in a fix. Somehow I answered the questions and completed my exam with a fear of failing. Meanwhile my mother completed 9 readings of Sai Kashta Nivaran Mantra. The minimum passing marks were 50 and I did not accept to get at least the minimum. When I informed this to my mother, she at once took a vow to complete 108 readings of Sai Kashta Nivaran Mantra in 12 days i.e. 9 readings per day and offer a rose garland and coconut to Sai Baba. Of course her reading of 1 day was completed there and then only. She consoled me and encouraged me to concentrate on the other remaining subjects. I did so and she also completed her reading. But deep within my heart I was afraid of failing. Right from beginning I had good academic record and now to pass a backlog subject will be very difficult for me. I did not know what to do. After few days I came to know that the questions were asked from old syllabus by mistake. As per the exam schedule I gave my exams in the very first month only and the mistake was rectified for next month examinations. This made more disappointed as the university is not generous in giving grace marks even if the fault is from their side. In March 2008, the results were declared. I was restless from morning. But what would happen to the children of Sai Baba? No difficulty, no calamity shall befall on them. To my surprise I passed with good marks in that subject with 62 marks and with overall 70% marks which was again unexpected. I thanked my Beloved Sai Baba who made this possible for me. We have heard a saying that if we dont study anything and just pray to God, God will not help us. This is totally opposite in case of Sai Baba. If any student is reading this please dont take it otherwise. I mean to say that if you put little effort in your studies, you can see Sai Baba standing with helping hands in front of you. Another point which came to my mind is this happened about four months ago and I would have posted it earlier. The reasons are best known to Sai Baba that why this incident was not posted till today and was reserved to be posted along with this mantra. Thanks for correcting. It will be updated soon. jab se sai meri zindagi mein aaye meri duniya badal gayi. luv u tons mere kripa dhan,mere sai!!!! excellent job!!! may baba bless u!! Shri Sai Baba alaways helped me and given solution to each and every problem I have faced. BABA! TAKE ME WITH U. HELP ME SAI. GUIDE ME ALWAYS. I WANT A LYF THAT SPEAKS. MANY DREAMS BABA, UNDECIDABLE. iska jeevant udaaharan mei hoon..
jai sai ram , bahut diya hai apne sab apka hai sai .. Thank you so much baba for all your blessings and for the blessings which are on our way. Thank You Baba for your blessings.